If you're wondering how you got here, it beats us... But since you're here, stay a while and enjoy of this site, which was put together by some somewhat-handsome criminals, and some almost-gorgeous criminalettes. Valparaiso, or "Valpo" as we call it*, has a series of awesome pieces, by extremely talented writers and muralists. Our intention is to take you there; to the underground; to the streets, to the alleyways, to the staircases... and show you a side of Valparaíso that very few people get to see. Valparaíso is the cultural capital of Chile, as well as the graffiti capital of Chile. Join us on our tours... let us take you to some places that the average travelers are not aware of. *Some call it "Valpa". Those are the same types of people that wear cowboy boots with sweatpants. No problem with that... just... you know... That's like adding tropical fruit to pizza. Chile was named Lonely Planet's 2018 "Best in Travel" (and we were there)! A Little Gift from us to the City! (Zana +UKD +ABSO18) Update... this was erased and now it's gray. Good Job, neighbors. Let us know if you wanna violate some human rights or something, and we'll come along and help you brand the victims. Everyday, helping you burn that fat into the ground (not literally... eww). Also available for private groups! This tour takes you to the underground world of Graffiti, where you'll learn about Tags, Throwies, Painting Trains (Though you won't paint one), Heaven Spots, Roll-downs, and much more! Private tour in a vehicle for your group! Visit Hills like Polanco, Baron, Lecheros, Playa Ancha, Arrayan and More! We have been getting many emails regarding the Polanco hill and tour to that place. There was a festival that took place there and the graffiti is absolutely awesome. However, we've gotten many visitors who have been there on their own telling us about their safety concerns, because many have had problems with the local pick-pockets, so, please don't go unless you have a local from the hill, and even then, please be careful. We have a tour called "Going All City", where we visit the Polanco hill, but it is done in a vehicle, and you have both a local driver and a local guide to watch for your safety. See Tour. Pasaje Wagner (Pee Alley as they call it)... It's where we sleep some nights. Jekse's Contribution to the Website. We keep asking him to stop painting on the walls so much, so he can contribute to our site some more. He won't listen. "One of the best ways to appreciate all this public art is to take a tour with Valpo Street Art"
- You'll walk through narrow streets and staircases that most people don't get to see, unless they were kidnapped. 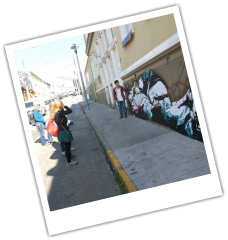 - You'll meet local urban artists from Valparaíso or that moved here to paint the city some more. 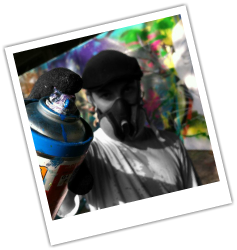 - We are the the Original, Official, True and Only REAL Graffiti & Street Art Tour Company. - Special Group Rates on Private Tours; Save upto 50% depending on your group size. "Eine absolut großartige Erfahrung und eine klare Empfehlung für jede/n, der/die an Graffiti und Streetart interessiert ist. Bunte Wände abseits der typischen Touri-straßen – mit einem rundum coolen und sympathischen Guide, der weiß wovon er spricht. Valpo Street Art Tours rocks! (RADIK – Writers Bench Crew – Germany)"
There are quite a number of "Tour Guides" & "Tour Companies" who are only in this business to make a quick Peso. They don't do our community any good and they damage the tourism industry. How does Valpo Street Art Tours offer you any assurance/ guarantee of its services? We are proud members of "Asociación Gremial de Guias de Turismo de Valparaiso". The official Tour Guide Association/ Guild of Valparaiso. Together, we work everyday to help our city grow, and create a sustainable industry.